In a stark, troubling, yet ultimately triumphant celebration of self-determination, award-winning author A. Manette Ansay re-creates a stifling world of guilty and pain, and the tormented souls who inhabit it. It is 1972 when circumstance carries Ellen Grier and her family back to Holly's Field, Wisconsin. 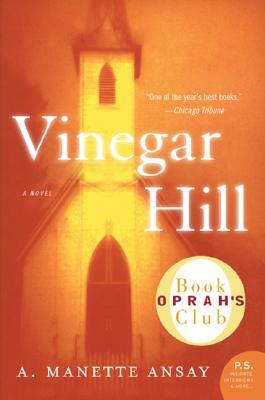 Dutifully accompanying her newly unemployed husband, Ellen has brought her two children into the home of her in-laws on Vinegar Hill -- a loveless house suffused with the settling dust of bitterness and routine -- where calculated cruelty is a way of life preserved and perpetuated in the service of a rigid, exacting and angry God. Behind a facade of false piety, there are sins and secrets in this place that could crush a vibrant young woman's passionate spirit. And here Ellen must find the straight to endure, change, and grow in the all-pervading darkness that threatens to destroy everything she is and everyone she loves.